One day past first quarter, some of the most interesting craters are visible on the moon: Plato, Copernicus, Tycho and Clavius, plus the Straight Wall. The first things to identify are the two major maria along the terminator. The larger of these, in the Northern Hemisphere, is the Mare Imbrium, which in English means the "Sea of Showers." The smaller, in the Southern Hemisphere, is the Mare Nubium, or "Sea of Clouds." These fanciful names date from a time when the plains on the moon were thought to be seas; now we know that they are dry waterless airless plains, the result of lava flows caused by the impact of huge asteroids billions of years ago. The two "seas" are separated at the moon's equator by a curved ridge of mountains, named after the Apennine Mountains of Earth, and the huge crater Copernicus. Let's start at the north pole and follow the terminator towards the south pole. Even the smallest telescope will show all the features discussed here, binoculars will show most of them, and many can be observed with care with the naked eye. It's surprising how much detail you can really see on the moon when you look closely. 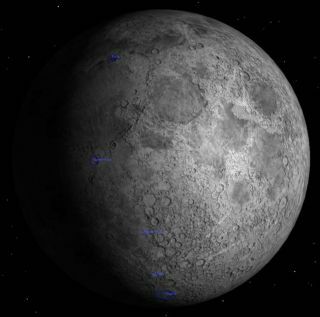 Just to the north of the Mare Imbrium is a broad range of mountains, the lunar Alps, with another small sea, the Mare Frigoris, the "Sea of Cold," further north still. There are two striking features in the lunar Alps: the large crater Plato and the Alpine Valley. Plato looks oval, but this is an optical illusion caused by its location at latitude 50°N; it really is circular. The Alpine Valley looks like a broad furrow through the mountains, just east of Plato. The floor of the Mare Imbrium is broken up by several large craters, Archimedes, Aristillus and Autolycus, and two high isolated mountain peaks, Pico and Piton. The crater Copernicus, which divides the moon north south, is surrounded by the ancient Carpathian Mountains, which have been flooded by lava flows from the Mare Imbrium to the north and the Mare Nubium to the south. If you're looking with a telescope, notice the difference between the crater Copernicus, with its central peak and terraced walls, and the crater Plato with its smooth featureless floor. The latter was flooded with lava shortly after it formed, while Copernicus never had that happen. Close to the south edge of the Mare Nubium there is an amazing feature: a 70 mile long (110 km) scarp or fault called the Rupes Recta, or "Straight Wall" in English. This looks like a mighty high cliff, but this is largely an illusion caused by the low angle of the sun. It is really only 900 feet (300 m) high, and has quite a gentle slope. In the southern highlands are two striking craters: Tycho, which is moderate in size at 50 miles in diameter (85 km) and Clavius, which at 140 miles (225 km) is one of the largest craters on the moon. They are a contrast in age. Tycho is a very young ("only" a hundred million years old) crater with an extensive ray system, mainly visible at full moon, while Clavius is a very old crater, almost as old as the moon itself, its walls and floor pockmarked with dozens of smaller newer craters. Now that we've reached the south pole, return for a moment to each of the four main craters we've looked at, as they represent most of the typical large craters found on the moon, while also displaying a variety of ages and forms.